I got my first cowboy hat when I was five years old. It was a Christmas present. I don’t remember who it was from, but most likely it was my paternal grandparents. Grandpa was an old-time cowboy from southeastern New Mexico who had worked on most of the big spreads from the Jingle Bob in his hometown of Roswell all the way up to the Breughmann Brothers’ spread outside of Laramie, Wyoming. 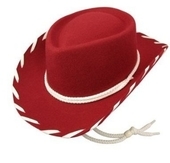 It was the typical kid’s toy cowboy hat of red felt with wide white laces around the flat brim, but I was proud of that hat. To me, it was never just a prop for playing Cowboys and Indians, although it certainly was used for that. Its real meaning was that I was on the path to being a real life cowboy. I knew all about cowboys. They were tough men who were soft spoken because they didn’t have to prove themselves. They had the confidence that comes from knowing that they could get the job done. They treated women, even fancy women, with respect. They didn’t take any guff from anyone, always told the truth, and they loved this country with all of their hearts. Oh, and they never cried. All of my heroes were cowboys. The men I admired and looked up to were men like my Grandpa, John Wayne, Tom Mix and Roy Rogers. I wanted to be just like them. Its been over a half century since I got that hat for Christmas, but I still wear one and have for most of those years. There were some years when it wasn’t possible. A good hat is expensive and I couldn’t always afford one when the old one wore out. Sometimes I had to make do with one made of straw. Sometimes none at all. For ten years, I served in the armed forces and the Marine Corps has its own ideas about proper headgear. I wore the prescribed uniform and was proud of it, but when off duty or off base, I would revert to my personal uniform of jeans, boots, western styled shirt, and cowboy hat. By the time I got out of the military, I wouldn’t dream of going outdoors without a hat, and most of the time it was western styled. The hats had become more than a head covering. They were an emblem of a philosophy and lifestyle that I am still proud to embrace. By then I had two years under my belt on the Southwest RCA rodeo circuit where I learned dozens of increasingly creative and highly entertaining ways to get off of a bucking horse. I also learned that cowboys, even when competing, were always willing to help one another. We talked freely about rodeo stock and how they bucked, which way they were likely to turn out of the chute gate, and how high and hard they would kick. Did this horse sunfish? Did he try to pull extra rein? Was that bull a man eater or was he likely to leave you alone once he got you off? I never once straddled a bucking chute but what one or more of my competitors was there helping me set my rigging or pull my bull rope tight for me and offering their advice, and I did the same for them. I’ve learned that there is a price to pay for this emblem of my lifestyle. I’ve been called a hick and a hayseed, but you’d better smile when you say it, and those that didn’t learned not to say it again. I’ve learned that many folks assume that it means I’m uneducated or even unintelligent. I’ve learned that there’s a stigma in the workplace where my hat is frowned upon or even considered unacceptable. This hat that I wear means that you won’t hear me complain about my aches and pains, or my thin wallet, or the lack of groceries in the pantry. It means that I will always give you an honest day’s work for a day’s pay. It means that when you ask me a question, you’re going to get an honest answer. You may not like what you hear, but you can take it to the bank. It means that you will usually find me in church on Sunday morning. But this hat doesn’t always just ride on my head. You’ll see it tipped forward or doffed completely as I hold a door for a lady. You’ll find it over my heart when a funeral procession passes by until the last car has passed. You’ll find it there when Old Glory passes or when I hear the Star Spangled Banner. You may find it in my hands but never on my head during a funeral or when I’m praying. You can find it on the seat beside me when I sit up to the table in a restaurant and you’ll find it absent when I’m in the house, because this hat knows what respect means. Over the years, this hat has kept the rain, the sleet and the snow from running down the back of my shirt collar. It keeps the rain and sun out of my eyes. It has provided shade for innumerable naps. It has been a basket for carrying anything from eggs to small animals. Its been knocked off in fights and ground into the dirt of numerous arenas, but I always pick it up and put it back on. This hat signifies my life-long love of animals, especially dogs and horses. It is symbolic of my understanding that nature, as brutal as it can be at times, is a gift from God. It means that I understand that man never has nor ever will build a cathedral anywhere near as magnificent as the Tetons, and I bow my head in reverence when I see what God hath wrought. Over the years I have learned, to no great surprise, that the cowboy lifestyle which I have tried to live, and which this hat is a symbol of, is extremely inclusive. Almost everyone knows of the Mexican vaqueros who were so much a part of our heritage in places like Texas and California. For those of you who don’t, they are especially known for their rope work. The vaqueros didn’t use the twisted rope common on this side of the border which is usually thirty or forty feet long. Vaqueros used a riata, a braided leather lasso often sixty to eighty feet in length, which required a great deal more skill both in roping a steer and controlling them after the catch. They could rope a steer from fifty feet away and then throw him to the ground with a flick of their wrist. They were real artists. Many people, nowadays, know that Australia, Brazil and many other countries produce some of the finest cowboys and rodeo riders on the planet. Fewer know that the old cattle trails were often blazed by black cowboys and lawmen, men like Bill Pickett who invented bulldogging or Bass Reeves who served as a highly respected Deputy U.S. Marshall under Judge Isaac Parker, policing the Indian Territory from Ft. Smith, Arkansas. Jesse Chisholm, who opened the Chisholm Trail was a mixed blood Cherokee. These men, like all cowboys, were judged not by the color of their skin, but by their honesty and the jobs they did. This is what being a cowboy means. In the course of the last fifty years, I’ve learned that one of the things I knew about cowboys as a child was wrong. Cowboys do cry. We cry when death claims a friend. We cry when we find an injured animal. We cry when our troops march by or we see Old Glory wave. We cry when we hear Taps played so mournfully on a trumpet. We even cry when we’re forced to watch a chick-flick like Love Story or Titanic. I’ve owned dozens of cowboy hats over the years. I’ve had white ones, black ones, brown ones. I’ve had them made from felt, straw, beaver and even buffalo hair. But no matter what shape, style or color my hat may be, it will always mean that I am a cowboy and all that it stands for.